Item: CVA 677-21 - C. P. R. Hotel, Vancouver, B.C. Item: CVA 677-245 - C.P.R. operators at York, B.C. Statements of responsibility: Photographer location: 553 Granville Street, Vancouver, B.C. 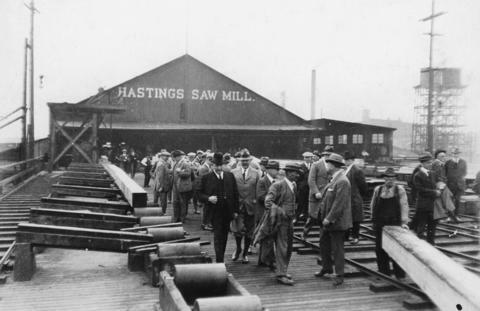 Photograph shows men walking out of the sawmill. Photograph is torn at the right edge. Transferred from the Vancouver Museum in September 1986.